- Picture yourself at Pictured Rocks this winter. POPPYCOCKS Secret-recipe soups from T.C.’s iconic bistro. 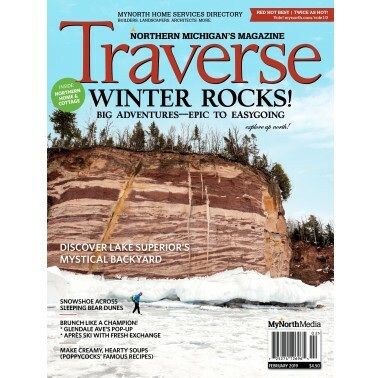 Jeff Smith, our beloved former Traverse editor, leads a winter snowshoe pilgrimage over our beloved Sleeping Bear Dunes. UP NORTH - Author Jerry Dennis kicks off a conversation about water; falling hard for a hardware store. THIS IS MYNORTH - Hang out with us online, on social and at MyNorth Tickets. FEBRUARY EVENTS - Community bonfire on Mackinac Island, Petoskey’s Winter Carnival, Flamekeeper plays the Dennos and so much more! UP IN MICHIGAN - Ever wonder what Mackinac Island is like in winter? OUTDOORS - Find your winter action on a frozen lake. DINING - A jar, a spoon and thou. LOCAL TABLE - Glendale Ave. is the new gotta-get-there brunch pop-up. DRINKS - Fortified wines that’ll ease you (happily) through the winter. LOVE OF THE LAND - Timbers Recreation Area. PLUS | NORTHERN HOME & COTTAGE - historic homes! A winter stroll, Lake Superior-style. Coming out of a movie at The State Theatre one winter night a few weeks ago, my husband, Neal, and I were in the mood for a great bowl of soup in downtown Traverse City. If you know the culinary options available now in just a few short blocks, you know narrowing it down can be a challenge. We decided on Poppycocks. Their Tomato-Spinach-Swiss always draws me back even though I inevitably order a different soup-of-the-day. It was crowded with its relaxed, warm vibe and as we waited for a table, my eye was drawn to the soda fountain, now with beer taps instead of the soda taps and blackboards alongside the big mirror introducing the always-creative specials, including a pasta special, a green plate and the ever-inspired gold plate. In that moment, it was impossible not to be drawn back decades to when that same soda fountain was a staple of the same space, only then the specials would be the hot turkey sandwich or the meatloaf dinner. The space that houses Poppycocks was once called Stacey’s, opened on Front Street by Chuck and Julie Stathakis in 1957, a truly iconic part of downtown until it closed in 1984. Stacey’s was Julie’s baby, a “five foot nothing” ball of fire who brought a childhood filled with hardship to the restaurant bearing her husband’s nick- name. ... Read the rest of Deborah Wyatt Fellows's column in the February 2019 issue of Traverse, Northern Michigan's Magazine.